Powered by hot temperatures and gusting winds, the Chimney Fire burned another three houses Wednesday, increasing the total number of homes destroyed by the blaze to 48. Between Wednesday morning and Thursday morning, the fire burned nearly an additional 3,000 acres, but the containment level remained the same. With temperatures in the mid to upper 90s and wind gusts of up to 18 mph, fire behavior was extreme Wednesday. Relative humidity was in the low teens. 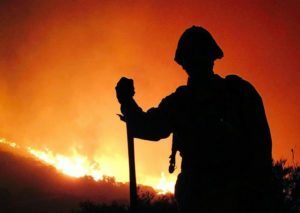 Hearst Castle remains threatened and further back fires are planned for Friday, according to Cal Fire. As of Thursday morning, the Chimney Fire has burned 43,633 acres and is 39 percent contained. Fire officials are projecting full containment of the blaze by Sept. 3. In addition to destroying 48 homes, the fire has wrecked 20 outbuildings and damaged another eight structures. A total of 1,898 structures have been threatened. The communities of Oak Shores, Christmas Cove, South Shore Village, Rancho Del Lago, Cal Shasta, Bryson Hesperia and Lake San Antonio remain threatened by the fire. Evacuation orders are in place for the residents of those communities and others. Cal Fire is requesting that people remain vigilant of emergency personnel and equipment as schools are back in session and traffic is increasing. In Santa Barbara County, the Rey Fire likewise is currently 39 percent contained. The Rey Fire has burned 31,505 acres in rural Santa Barbara County. Besides the people who lost their homes, wait until the taxpayers find out what this fire suppression is costing…all because of someone’s “unintentional” start of this fire.